New deal will last until end of 2022 season. 2020 will mark 20th year of the agreement. 17 championship games to be screened this summer. TG4 have announced a four-year extension of their sponsorship of the Ladies Gaelic Football inter-county championships, with the new deal set to last until the conclusion of the 2022 season. Speaking at the launch of the 2018 TG4 All-Ireland Ladies Football championships, TG4 Ardstiúrthóir Alan Esslemont expressed his delight at the new agreement which extends the TG4 sponsorship and broadcast rights agreements with the Ladies Gaelic Football Association (LGFA). TG4 became title sponsors of the Ladies Football championships in 2000 and 2020 will mark the 20th year of the agreement. This is the second major sponsorship renewal for the LGFA in 2018, after National League sponsors Lidl committed to a further three years, taking the LGFA’s retail partners up to and including 2021. TG4 have committed to screening 17 championship fixtures during the 2018 season, beginning on Saturday, July 14 and running until All-Ireland final day on Sunday, September 16, when the junior, intermediate and senior finals will be screened exclusively LIVE. 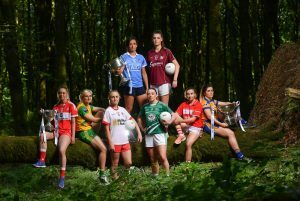 Over the course of eight weekends, TG4 will bring viewers the very best action from the revamped senior championship, which will be played on a round-robin basis before the eight quarter-finalists are determined. TG4 and the LGFA have also announced that a very special All-Ireland final preview show will be broadcast LIVE from the Mansion House on the eve of the finals, Saturday, September 15. This show will not just focus on the TG4 All-Ireland finals, however, and will serve as a wider celebration of women in sport, with this fast-paced and fully charged bilingual Entertainment special set to feature a heady mix of music, celebration and entertaining discussion with some very special guests. There has never been a more exciting time in Ladies Gaelic Football than now. The fastest-growing sport in the country, last September’s TG4 All-Ireland finals attracted a record 46,286 attendance to Croke Park, a figure that was a world record for a standalone female sporting event last year. TG4 also confirmed record TV viewing figures of 563,000, standing as a testament to the day’s success. TG4’s coverage attracts a significant TV audience in Ireland and globally on the TG4 Player www.tg4.tv. Speaking on behalf of TG4, Ardstiúrthóir Alan Esslemont said: “TG4 welcomes this opportunity to reaffirm our pride in our long and unique association with this great Irish sport. This combines sponsorship of the Championship with the role of TV broadcast rights holder in a multi-platform offering for followers of this now global sport. “This partnership between TG4 and the LGFA has been developed over many years. The comprehensive coverage TG4 gives the games at all levels shows the importance we place on this wonderful sport which is developing and growing in prominence year on year. It is another great example of our rich culture and heritage and we are very proud to be associated with it and the ever strengthening bond between the Irish language and Peil na mBan. “This is Bliain na Gaeilge and TG4 is delighted that the LGFA is substantially increasing the profile of the Irish language throughout the association. Through our very successful partnership with LGFA and Lidl, TG4 is extremely proud that we can help to give women’s football the prominence it deserves. 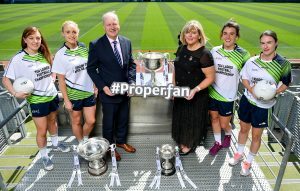 The #properfan campaign has contributed to a surge in interest in the games and the stunning success of last year’s LGFA Championship has brought a very welcome focus onto all women’s sports throughout Ireland. Marie Hickey, President of the Ladies Gaelic Football Association, commented: “We are delighted to confirm the extension of our long-running partnership with TG4. “They have become synonymous with Ladies Gaelic Football since the year 2000 and have helped to take our sport to new and unprecedented levels. “With such a large overseas population to cater for, and huge interest in our sport across the globe, TG4’s ability to provide coverage to people located outside of Ireland is hugely important to us. “Women’s sport remains very much on the rise and on an upward curve, with increased coverage playing a big part in that. “TG4 have embraced the concept of our revamped championships and will bring even more action to TV viewers this summer. “Ladies Football continues to lead the way in Irish women’s sport and after we set a new attendance record in 2017, we’re aiming to go even higher again in September. “We need the help of clubs and counties to achieve that and I’d appeal to all sports fans to get behind these fabulous players as they set out on a potential journey to Croke Park via the All-Ireland series. “Anyone who was fortunate to be present at Croke Park last September for the TG4 All-Ireland finals took home memories to last a lifetime. “Now it’s time for even more people to show that they’re a #properfan as we get ready for the start of a new season. “TG4 continue to strive for innovation in their coverage, whether it’s preview, live or review, and we look forward to another stellar season of inter-county action. The 2018 TG4 All-Ireland Ladies Football championships were officially launched at Croke Park today, with representatives from all 32 participating teams present at the venue which will host the 45th finals on September 16. Holders Dublin will play their first qualifier game against Cavan on July 21, before facing Mayo on July 28, in what will be a repeat of the 2017 All-Ireland final. Elsewhere, Cork will harbour hopes of regaining the title they last won in 2016 after claiming the TG4 Munster senior title. In the West, Galway made it back-to-back Connacht senior titles and Donegal were most impressive on their way to Ulster glory. The counties will follow a new route to Croke Park as four qualifier groups contain three teams in each. Each team will play two games each in their respective groups and, from there, eight quarter-finalists will emerge. The TG4 intermediate and junior championships will be keenly contested once again and will produce some cracking fare. Tyrone, beaten All-Ireland finalists last year, won another Ulster title recently and will start as one of the favourites to land the Mary Quinn Memorial Cup. They’ll face stiff opposition from a number of counties, however, including no fewer than seven Leinster representatives. Roscommon, who claimed an historic Connacht title last month, will also fancy their chances of making an impact. The TG4 junior championship will feature seven counties and London, who were beaten semi-finalists after extra-time against eventual winners Fermanagh last year, are a strong outfit and looking to go a step or two better. Derry, who lost the 2017 final replay to Fermanagh, are reigning Ulster champions and won’t lack in motivation either. This is an extremely exciting grade and one worth keeping a close eye on. Clare and Down have the privilege of getting the 2018 TG4 All-Ireland championships underway next Sunday, July 8, when they meet in a Group 3, round 1 clash in Kinnegad (2.0).